How can I fix my rear derailleur's B-tension adjustment? I've noticed that my rear derailleur (Ultegra 6700) will not return to where I've set the B-tension adjustment. Pulling it away from the hanger means it will just stick there, or maybe move back a little bit. Comparing to other bikes with Shimano rear derailleurs, mine seems to be odd one out. It mostly causes annoyance when removing the rear wheel -- I have to push the derailleur back "in" afterwards, instead of relying on it just naturally going back to the correct position. If I understand you correctly, you don't have a B-Tension issue. B-Tension sets the clearance between the upper derailleur pulley and the chain, and should not be used to add spring return force to a derailleur. In this case, I believe that the derailleur pivots are in need of cleaning and lubrication, and I would start there. If that doesn't fix the issue, you can look at replacing the derailleur return spring (#2 in photo)behind the fixing bolt of the derailleur and/or the cage spring (#1 in photo)between the derailleur body and the derailleur cage. Assuming you have already backed the B-tension screw all the way out, I believe your B-tension spring has simply lost its tension. Mine is the same way. I know that spring is replaceable in some derailleurs, and checking whether it is in this one is on my list of things to do. Check with your local bike shop. Not the answer you're looking for? 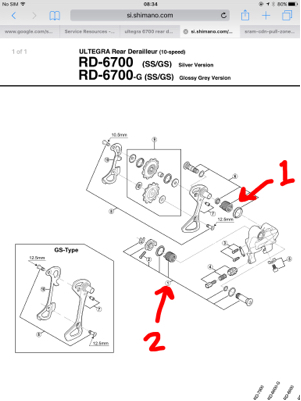 Browse other questions tagged derailleur derailleur-rear or ask your own question. Derailleur adjustment: front or rear first?